The new speaker of the U.S. House of Representatives, Paul Ryan, said Republicans have been too timid on policy despite controlling both houses of Congress, and he promised a bold alternative agenda in solving the nation’s problems. Ryan, who was overwhelmingly elected by members of Congress last week, took to the circuit of Sunday television news shows to tell viewers it's not possible to debate comprehensive immigration reform as long as President Barack Obama is in office. The 45-year old Ryan, the youngest speaker elected in more than 100 years, said his election represents a new day. He promised to break with the past by offering four objectives. "No. 1, get the House working again like it was intended to work, like the Founders intended it to work, open up the process," Ryan said. "No. 2, I think it’s very important that we do find common ground ... to advance the nation’s interests and do it in a way that we don’t have to compromise principle. No. 3, we have to be a more effective opposition party. We do not like the direction the country is headed. We do not like the direction the president is taking the country. So, we have to be an effective opposition party but, most importantly, No. 4, I think that means we have to be a proposition party. "If we don’t like what’s going on, we owe it to the people of this nation, to our constituents, a bold, specific and clear agenda, and a vision for how we would do things differently," he added. 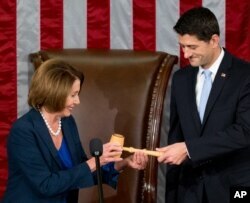 Newly elected House Speaker Paul Ryan of Wis., receives the Speaker's gavel from House Minority Leader Nancy Pelosi of Calif., in the House Chamber on Capitol Hill in Washington, Oct. 29, 2015. But, one issue he won’t allow to go forward is comprehensive immigration legislation, so long as Obama is in office because, Ryan said, the president has proven to be untrustworthy on the issue. "He tried to go around Congress with an executive order to rewrite laws unilaterally. 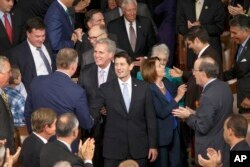 Presidents don’t write laws, Congress writes laws," the speaker said. "... We won’t bring immigration legislation with a president we cannot trust on this issue. If we believe, and have consensus, on things like border enforcement and interior security, then that’s fine." A year ago, Obama issued an executive order granting three-year work permits to millions of people who have been in the U.S. illegally for at least five years and who are parents of U.S. citizens or legal residents. It also allowed those who entered the country illegally, as minors, before 2010 to become eligible for amnesty. But, the order’s full implementation has been blocked by a federal court and is under appeal. Ryan, who noted some 46 million Americans live in poverty, said he believes Congress should offer proposals on tax and health care reform to attack the root causes of poverty and get the economy moving. He was asked whether he intended to make public the text of the secretive Trans-Pacific Partnership (TPP) free trade agreement, which he co-authored and which has been championed by the Obama administration. "When that text comes to Congress, it has to be made public for at least 60 days," he said. "... So, the law that we wrote requires that the country get to read every piece of this agreement." Organizations such as the AFL-CIO labor union have criticized the agreement, or at least what they know of it. "Unfortunately, it is becoming clear the TPP will not create jobs, protect the environment and ensure safe imports," the labor union's website says, comparing it to the North American Free Trade Agreement, in which "the largest global corporations benefit and working families are left behind." Newly-elected House Speaker Paul Ryan of Wis., escorted by House Minority Leader Nancy Pelosi of Calif., and House Majority Leader Kevin McCarthy of Calif., walks into the House Chamber on Capitol Hill in Washington, Oct. 29, 2015. Ryan, who is second in line of succession to the presidency behind the vice president, said he was elected to unify Republicans and plans to operate by leading the House to consensus, rather than dictating consensus. The Wisconsin lawmaker said Republicans fight over tactics because they don’t have an alternative vision. He said that if Republicans win the White House and retain Congress in 2016, they will be able to show the public how they will fix the nation’s pressing problems.